Wow, did we just jump forward a couple of thousand comps? Yes! Why? I dont know. 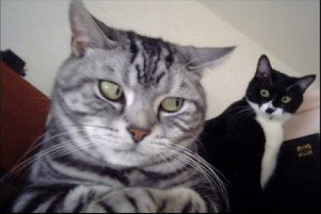 Either way, these two cats are up to something, or something is up to them. Whatever! Think of something funny to say about this image, or to caption this image, you’ve got a week, so make it good, i.e FUNNY. Winner receives a USB something! It wont be any old prize, it’ll be a USB prize, maybe with little electrical lightnings shooting around inside it. Previous Previous post: Shop Video Diary PII!